On a cool spring day there is nothing better than a nice bowl of flavorful soup. 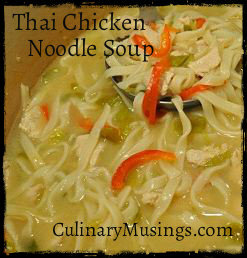 This Thai chicken soup with noodles is the perfect recipe to warm your core. The flavor is amazing with fresh ginger and coconut milk. 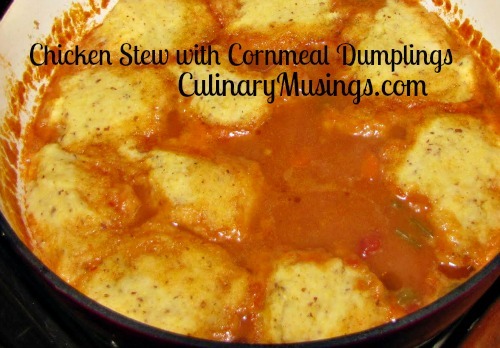 You cannot go wrong with this soup so make sure you give it a try on a nice cool day. Begin by boiling water in a kettle or pan for soaking the egg noodles. On the package it should give you a time for soaking depending on the brand of noodles. Once they finish soaking, drain the water off your noodles using the strainer and set them aside. Take your boneless chicken thighs and cut them into small diced size pieces. Then cut the ends off your red pepper and make a single slice down one side. Roll it flat and cut off the seeds and light part making it a large rectangle. Then cut the pepper into half inch squares. Set them aside. Wash your scallions and then slice the white parts and green parts into thin slices keeping them separate for cooking. Then mince your garlic and peel the ginger so you can grate it with a small grater. Make sure you grate about a tablespoon of fresh ginger. Then place the oil in the bottom of the wok or saucepan and turn the heat on medium high. Cook the chicken for about five minutes or until cooked on all sides. Then add the white scallions, minced garlic and grated ginger to the pan and cook for another two minutes. Now open the can of coconut milk, stir it well and measure out a cup to add it to the pan. Then add the chicken broth, soy sauce, peanut butter and curry paste. If you want a mild soup you can use yellow curry, medium soup use green curry and spicy soup use red curry. Add salt and pepper to taste. Bring the soup to a boil and then simmer it for about ten minutes to allow the flavors to cook together. Finally add the sweet red bell peppers, green scallions and noodles simmer for another two to three minute. Serve immediately and make sure you get plenty of noodles in each bowl. Eat the soup with a spoon and fork so you can enjoy the noodles, veggies and the broth.